American poet Joyce Kilmer may have been inspired to write his famed poem “Trees” if had chanced to pass by Elmhurst, The House of Friendship’s front lawn, where a majestic Shumard oak stands at the corner of the expansive front porch. 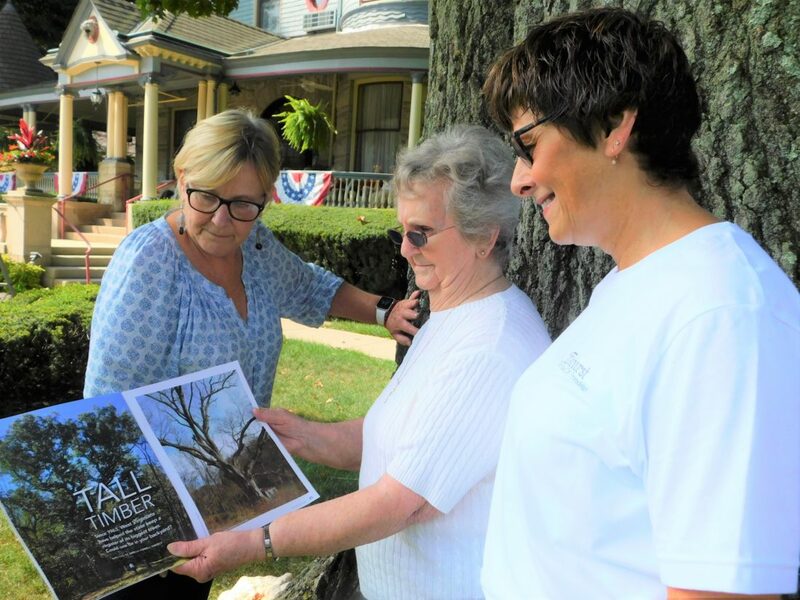 The tree, planted after the turn of the 20th century, has been designated the West Virginia State Champion for its species, said Elmhurst Executive Director Jamie Crow. Robert Hannah, Urban Forestry coordinator for the state Division of Forestry, announced the designation Thursday in correspondence to Elmhurst, Crow said. Elmhurst’s director of nursing, Janice Bippus, brought the tree to Hannah’s attention in early August after realizing it had to be one of the largest trees, in circumference, of its kind. Bipppus said a resident of Elmhurst, Ila McConaughey, read an article about award-winning trees in current issue of Wild, Wonderful, West Virginia magazine. McConaughey told Bippus that the Elmhurst oak tree warranted an inspection by the forestry officials. After some research, Bippus contacted Hannah. Bippus credits McConaughey’s curiosity with the top tree designation. “We always felt our trees were special, but Ila’s prompting led to proof that we have a winner,” Bippus said. During a visit to Elmhurst, Hannah and Sam Adams measured the tree around to a total of 204 inches and estimated the height at 64 feet. He noted the tree is in good condition and that the crown of the tree “has recovered nicely” to a spread of 83.5 feet, after having been topped years ago. The tree scored a total of 289 points on the “big tree” scale established by the state. It surpasses the former largest Shumard in the state found in Morgantown, Crow said Hannah revealed. According to the information at the forestry department, Shumard oaks are rare in the state and are found more often counties from Wayne to Jackson. At one time, a Mingo White Oak grown in Mingo County was measured at 145 feet with a spread of 96 feet and a diameter of 27.5 feet. The tree was determined to have been 582 years old when it died in the 1930s. There is a second Shumard on the other side of the Elmhurst porch, and although similarly large, is not champion in size. Hannah is expected to return during the winter to attempt to get to the actual highest point of the champion tree for a more accurate measurement in height. When Elmhurst was built in 1891 by Bloch Brothers Tobacco magnate Samuel S. Bloch, there were no trees in the front yard near the porch. Bloch eventually had elm trees planted throughout the estate, as well as an elaborate garden with flowing fountains, an arboretum, a swimming pool and pond. A blight signaled the demise of the elm trees in the last century. As part of its 125th anniversary celebration, Elmhurst planted a new elm tree in the back lawn. Hannah recommended that any further pruning of the tree be done only by a certified arborist in order to maintain the health and vigor of the tree.